1. A son of Elioenai in the Davidic genealogy (I Chron. iii. 24; A. V. "Dalaiah"). 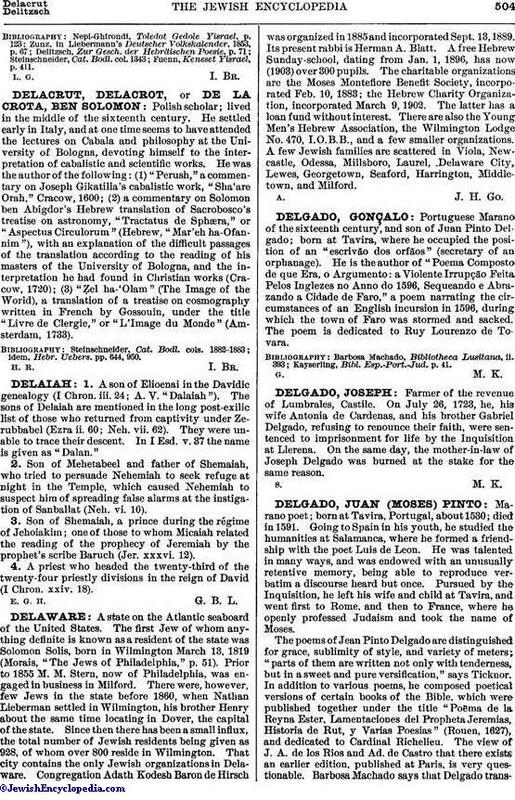 The sons of Delaiah are mentioned in the long post-exilic list of those who returned from captivity under Zerubbabel (Ezra ii. 60; Neh. vii. 62). They were unable to trace their descent. In I Esd. v. 37 the name is given as "Dalan." 2. Son of Mehetabeel and father of Shemaiah, who tried to persuade Nehemiah to seek refuge at night in the Temple, which caused Nehemiah to suspect him of spreading false alarms at the instigation of Sanballat (Neh. vi. 10). 3. Son of Shemaiah, a prince during the régime of Jehoiakim; one of those to whom Micaiah related the reading of the prophecy of Jeremiah by the prophet's scribe Baruch (Jer. xxxvi. 12). 4. A priest who headed the twenty-third of the twenty-four priestly divisions in the reign of David (I Chron. xxiv. 18).